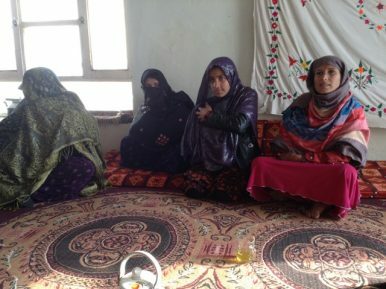 Kuchi women in Parwan province district share their stories. Every woman in this country has a hundred owners. It’s always been like that. Fathers, brothers, uncles, neighbors. They all believe they have the right to speak on our behalf and make decisions for us. That’s why our stories are never heard but buried with us underground. Kuchis, traditionally nomadic communities, are considered to be one of the poorest and most marginalized groups in Afghanistan. Over the centuries, Kuchis, whose numbers are estimated from 300,000 to 3 million, have pursued a migratory life, herding caravans of sheep, goats, and camels around the country. However, decades of conflict and drought have increasingly forced Afghanistan’s Kuchis to abandon their traditional lifestyle and relocate to settled areas. Some of the destitute Kuchi pastoralists have lost their livestock and sought to settle permanently and semi-permanently in unregulated areas, resulting in conflict with local residents and commanders due to the issues around land ownership and water access. With many living in refugee camps and temporary accommodations, the majority of Kuchis suffer stigma, exclusion, and discrimination at the institutional, political, and social level wherein their identity is questioned and misunderstood. The National Vulnerability Analysis Report of Afghanistan states that Kuchi communities (both nomadic and semi-sedentary) have limited access to health, education, and livelihood standards since the government doesn’t collect disaggregated data on Kuchis. The indicators are far worse for Kuchi girls and women as compared to other poor women in the country. The enervating poverty faced by Kuchis has a direct impact on girls in achieving social and well-being indicators. Standing behind a roughly painted turquoise door, an 8-year-old girl, Lida, peeks out when she notices a group of Afghan officials and expats speaking to her father and brother. She exchanges glances and smiles, inviting herself out of a roughly structured home that can only belong to a nomadic family. Unable to conceal her excitement, Lida eagerly and carelessly takes a swift step outside the door. But then her 14-year-old brother, Tariq, standing outside with his brothers and uncles, gives her a sharp, stern look with bloodshot eyes and clenches his teeth, muttering sullenly, “How dare you – get back in.” Lida quietly lowers her eyes and hides behind the door. Her mother, Karima, appears and drags her inside a large rundown, ramshackle house. She receives two slaps on her left cheek while her 10-month-old sister, Gzifa, who is crawling, gets kicked in the face for being in the way. Gzifa cries out but no support or help is provided. Karima shuts the door behind her, kicking Gzifa almost absentmindedly again and leaving her in the dusty courtyard to cry. Ethnically, the vast majority of Kuchis are Pashtun, who have stricter gender rules. Girls as young as 8 are not allowed to leave their house without the permission of a male member of the family, which includes brothers as young as 10. In most cases a male member of the family would need to accompany her. In general, girls are not allowed to go and seek education. They get married and bear children early. Lida moved with her father and two uncles, their 9 wives, and 43 children to Parwan as sedentary Kuchis as they lost the majority of their livestock due to drought and conflict. Her brothers go to school provided by the local government. However, they don’t attend classes regularly due to corporal punishment and the quality of education. The brothers spend most of their time hanging out with other boys in the neighborhood. The National Vulnerability Analysis Report also highlights a significant gender disparity in net primary school enrollment, especially among Kuchis. Hamid announces that “Lida will be married of before she is 11,” proudly pointing toward her brothers. “They will take care of everything,” he says, at which her brothers’ chests expand and shoulders broaden. Lida has 21 other sisters, six of whom are married. Two of them, aged 13 and 14, were exchanged to resolve conflict with a landowner as Hamid’s family tried accessing clean water. Girls and boys queue up to collect water from a local hand pump recently installed by a government ministry. Photo by Ritu Mahendru. 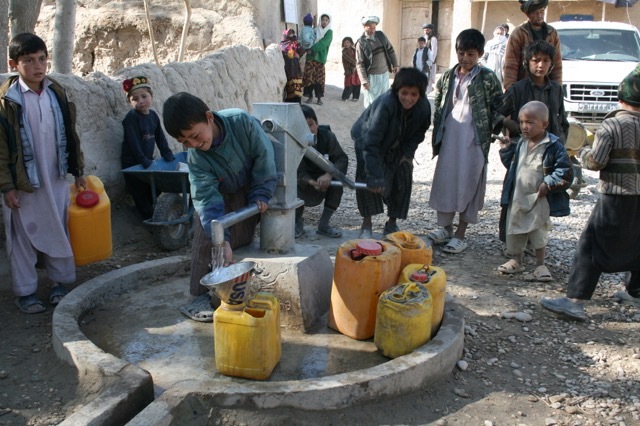 The Danish Committee for Aid to Afghanistan in 2018 reported that only 45.5 percent of Afghans have access to safe drinking water. A large percentage of the population spends 4-7 hours to collect their drinking water from ditches, canals, and rivers, which often are polluted, and carry water-borne diseases. In many Kuchi groups, women are responsible for fetching water for household consumption. Because of the need to keep herds and encampments away from villages and cultivated land, women often have to walk considerable distances to collect water and may encounter men from outside their communities when doing so. Access to water is a controversial issue for nomadic and semi-sedentary Kuchis, especially if they do not have access to land. They end up relying on common property sources, such as rivers, streams, and canals, or, alternatively negotiate to buy water from private or community-owned water sources. When water is accessed without the permission of a landowner it could potentially spark life-threatening situations: blood feuds, disputes, and serious conflicts that could result in murders with impunity. This could lead to exchange of girls and women to resolve conflicts, as happened to Lida’s sisters. In addition, many young girls and women on their way to fetch water become subjects of sexual and gender-based violence. When asked if they reported the case, Karima says no. “We didn’t [report] because she brought shame to our family.” Karima didn’t know where her sister was anymore. There is no disaggregated data to show the sexual and reproductive health (SRH) vulnerabilities faced by Kuchi women, who are constantly on the move and lack SRH rights support. There is a lack of data and information that clearly describes the challenges Kuchi women face. Jamila, who suffers from debilitating stress, looks weak, frail, and ill. Hamid doesn’t understand why is she always ill and keeps crying. “I need to take her to the Shrine again. She is always ill and sad. I don’t know what’s wrong with her,” he says. Kuchi Afghan women face a number of challenges and deprivations. They are denied access to education, married off as children, raped, and exchanged to settle disputes. Yet policymakers and international donor agencies in Afghanistan have inadequately addressed vulnerabilities faced by Kuchi girls and women. They remain an almost invisible group in policy practices and dialogues. There is no ready information available on the lived realities of Kuchi women who have experienced or faced gender- and sexual-based violence, lack health services and education, and are married earlier. The only information on Kuchi girls and women is currently anecdotal. While the Kuchis are becoming more politically aware and are exercising their voting rights, there is a need for the government to go beyond political process and be engaged in their social realities. While evolving policies have increasingly aimed to include nomadic groups, an overemphasis on mobility has distracted policymakers from going beyond infrastructure when Kuchi needs are also social and gendered. Ritu Mahendru is a freelance journalist with a Ph.D. in sociology. She writes about gender, race, sexuality, migration, and conflict. Her work has appeared in Open Democracy, the Middle-East Eye, and Arab Weekly.